Happy birthday to my little sister (October 3), who also happens to be a Libra! I have to admit this past week’s reading was dead on for me with challenging information in love leading to more production. This week’s reading makes me very excited, not least because I am moving (and get a great new reading/meditation room) and an old friend is coming back into my life. It’s going to be a phenomenal week! WHERE WE’VE COME FROM – The Chariot (Cancer). VICTORY. I call this card the “keeping your eye on the ball” card because you can achieve what you want by harnessing your energy and applying it wisely. It’s a time to master emotions and curb impulses to exert your true will toward progress. This is winning, dominating and reaching a goal by harnessing your willpower and concentration. You will need to be disciplined, master your emotions, and assert yourself to achieve your desired results. You will see progress if you put your true will into action. Be confident, in control, and don’t doubt yourself. You can win if you’re driven enough! WHERE WE ARE – Knight of Cups (Water signs: Pisces, Cancer, Scorpio. Birth dates: October 11 – November 11). As a person, this knight is romantic, creative/artistic, introspective and imaginative; his goals are geared toward that which makes him emote, and creative inspiration. In showing his darker side, he can be a drama queen, introverted, merciless, or prone to flights of fancy (come back to down to earth every once in a while). He could be offering interesting invitations. All Knights bring change, and as the Knight of Cups, that change could involve the emotions, close relationships or your spiritual self. If he’s not a person in your life, but a situation/action, he is asking you to keep your emotional balance with new relationships and opportunities in love. He’s also asking you to embark on a journey where you can listen to your instincts, your gut. Take this time to get in tune with your emotions and intuition, improving their flow. It’s time to care for the health and well-being of the heart and soul. WHERE WE WILL BE – The Hierophant (Taurus). EDUCATION/ORGANIZATION. The Hierophant can indicate higher learning whether formally (in an institution) or informally (with friends/co-workers). He often relates to seeking or being a mentor; he knows the best teachers are still the best students because knowledge is infinite. He makes concepts tangible, translating principle into practice. He comprehends the connection of mind and spirit through an understanding of the metaphysical and esoteric arts. The Hierophant unites the lower and higher self, being the mediator between. This card can also relate to organizations, group identity and being committed to a common cause. He often brings an expanding of horizons and broadening of views. FOUNDATION – 9 of Cups (Pisces). JOY. A time of emotional/spiritual fulfillment and understanding. Feeling satisfaction, contentedness, likely even peace. Many readers of the Tarot see the 9 of Cups as “the wish card”. It’s a time when worries, anxieties and fears can disappear while you materialize new things in your life. There is a sense of flow and movement (blockages removed) in the heart and soul. Experience the beauty and pleasure to be found in the world. This card sheds loving light on the cards around it. 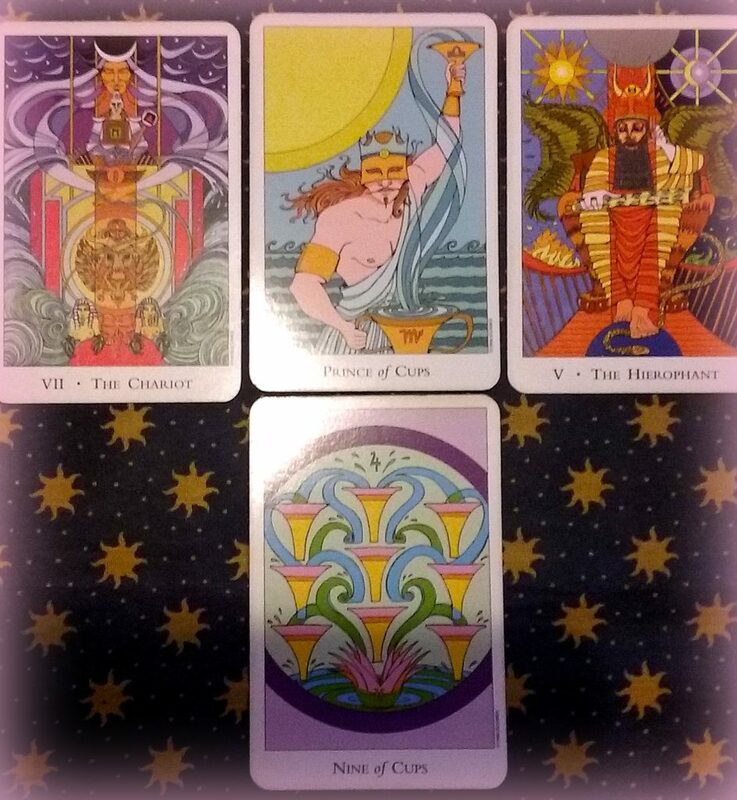 9 of cups, chariot, hierophant, knight of cups, nine of cups, prince of cups, weekly reading, weekly readings, weekly tarot. Bookmark.